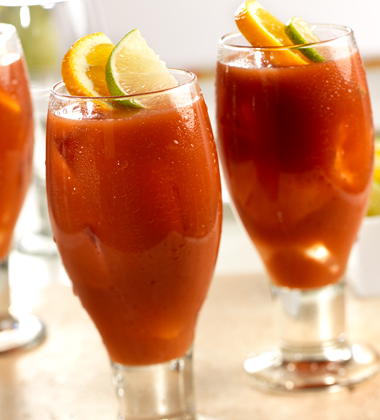 Filling but light, this hot weather drink made with V8, orange, lime and seltzer will appeal to everyone. lime zest, fresh	 2 tbsp. 1. In large lidded container combine juice, orange concentrate, lime juice and zest and mix well. Cover and refrigerate at least 4 hours before using as directed. Make ahead and store up to 3 days refrigerated. 2. For Each Serving: In 24-oz. glass stir together 3/4 cup juice-orange mixture with 3/4 cup seltzer and fill remaining glass with ice (1 1/2 cups). CCP: Serve beverage chilled to below 40 °F. 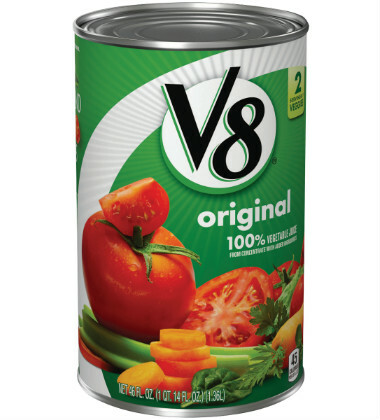 Suggested substitutions: V8 Spicy Hot Vegetable Juice or V8 Low Sodium Vegetable Juice. Lemonade, limeade, etc. can also be substituted.